This is my absolutely favorite time of year: the sun's already up when the alarm rings and doesn't go down till almost 9PM…I'm always shocked by how much more energy I have in early summer than in winter, fall, or even spring. And I can't remember another last-week-of-June when everything was so verdant…so far this summer's weather has been just the right combination of rain, sun, cool, and warm temperatures! And I can think of only two downsides to all this seasonal wonderfulness. One, if you grow your own veggies and fruit, even after giving lots away to friends and family, you still probably have more produce on your hands than you can eat. And two, in the dead of winter it'll all be gone. I'm happy to offer a couple of solutions, however. These days you don't have to look far for good info on various ways to preserve overflowing harvests but for a wonderful summary of ALL possible methods click here. Tower Garden was born when the Juice Plus+® company purchased a patent from Epcot Center’s Living the Land Pavilion then improved upon it, creating a food production system designed for literally anybody and any application. Tower Garden works just as well in the corner of a room as it does in a tiny apartment patio, a rooftop garden, an urban farm, or a huge commercial growing operation. And because of its vertical design, the system is SUPER energy efficient and has a tiny circular footprint (only about 2.5 feet in diameter!) Each tower can grow up to 44 plants without soil but with 90% less space and water. But here's the real kicker: plants grown in a Tower Garden mature at LIGHTNING-SPEED compared to conventional gardening methods…the plants in my Tower Garden (pictured below) are as close to producing as the plants in my container garden just to the left but each one of my 20 Tower Garden plants began as SINGLE SEEDS only about 7 weeks ago, while the plants in my container were already about the size you see here when I purchased them about 2 weeks ago! And in the fall when my container plants will undoubtedly be dying, I'll simply move my Tower Garden inside and just keep on growing my own fresh produce all winter long…for more information on Tower Garden (or, better yet, to purchase one!) click here. But what's the big picture here, you may ask? 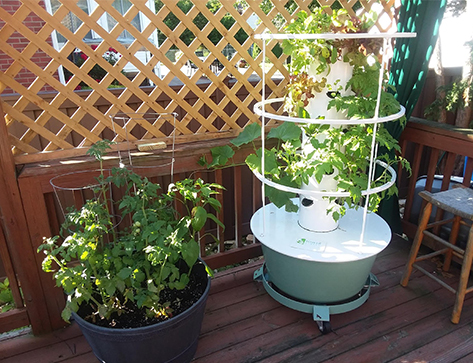 Tower garden offers an EASY, COST-EFFECTIVE way to meet the recommendations of every major world health organization (including THE World Health Organization! ): turns out a great deal of science has repeatedly proven we should be eating at least 9-13 servings of fresh whole produce every day just to maintain our health! In fact there’s actually a growing body of evidence to suggest that consuming more than the daily recommendation of vegetables and fruits improves health without limit…in other words, THE MORE VEGETABLES AND FRUITS YOU EAT, THE HEALTHIER YOU'LL BE, PERIOD!!! while potentially ELIMINATING the need for synthetic fiber, vitamin, mineral, and enzyme/probiotic supplements!